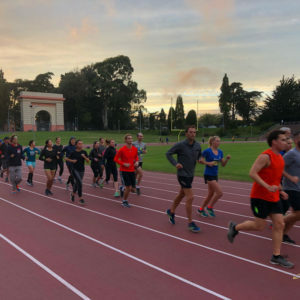 Over the past three years, GGRC has been lucky enough to have Xavier Shay lead our members at our weekly Wednesday track workouts at Kezar Stadium. This year he is putting on the retirement cap and passing the baton to Will Barkan. In honor of his service, we wanted to have him share some of his thoughts on the coaching experience and offer some advice to our members. Why did you get interested in coaching? The year before I became coach, I attended virtually every Wednesday track. I knew a bit about putting a workout together, so seemed an obvious way for met to give back to the club when Ben (previous coach) decided to run for President. Track can be intimidating for newcomers. What advice would you give to someone that has never run on a track with a group or in an organized setting? Biggest misconception I hear is “I’m not fast enough for track”. 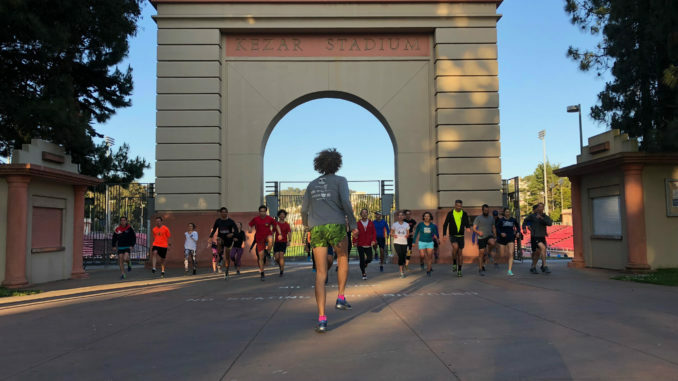 Track is great particularly if you’re slow because you can do your own thing, not get dropped, and still be able to easily socialize with and meet other runners. Also no one starts fast – this is why we train! You have helped multiple people achieve new personal records in all sorts of races during your time coaching. What would you say is the number one aspect that contributes to an individual’s success? Consistency. Run 4 days a week, every week, for 16 weeks. For newer runners in particular, this works wonders. Run more. For more experienced runners, slowly increasing mileage (usually into the 40+mi/week range) is needed to continue to see gains. This needs to be done sensibly – increasing mileage too fast leads to injury (I speak from personal experience!). GGRC does a number of races a year as a group. 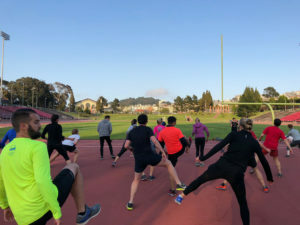 How do you tailor track workouts to fit in with the upcoming events? 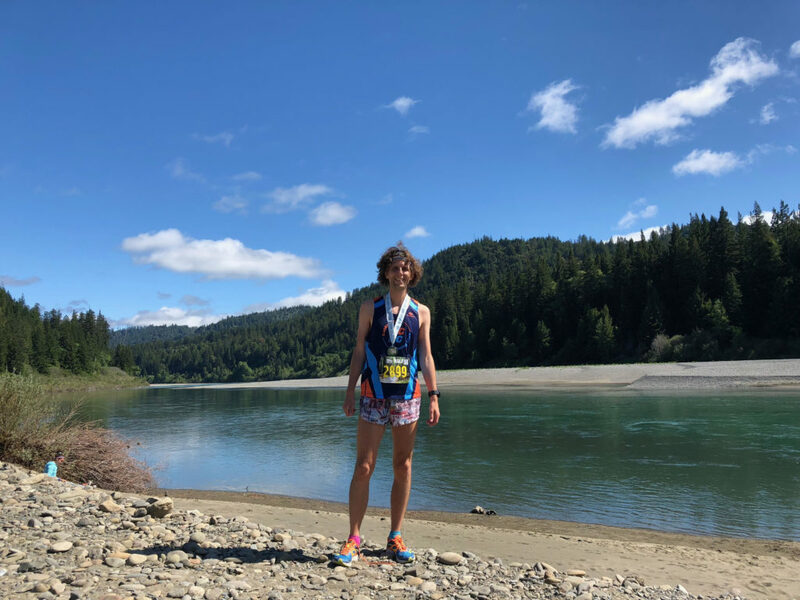 In the last 4-6 weeks before a race, I start making the workouts approach “race pace” to help develop specific endurance for that pace and to get people running at. This usually means longer intervals, but slower. As long as I’m outside. I can’t remember last time I ran on a treadmill. How do you feel about people that skip track practice when it rains? They don’t know what they’re missing. Running in the rain is one of my favourite things. What is your favorite post track Yancy’s meal? Soba noodles with extra broccoli from Loving Hut. Except they just started closing on Wednesdays, so I don’t know what to do with myself. What’s one thing every runner should do? Travel for running, with friends. I’ve had so many great trips this year: to Tahoe, to Sequoia, to Healdsburg. Nothing better than spending a weekend away, running, eating, and drinking. What are you going to do in your post GGRC Track coach retirement years? Probably just keep showing up to track? How short is too short for men’s running shorts? No such thing. If ran for coach again it would be on a platform to ban anything longer than a 3″ split. What advice would you pass along to the next series of GGRC Track coaches? Newbies don’t come to track to get fast, they come to meet people and have fun. If you see Xavier around, give him a thanks for his years of service. His welcoming spirit and willingness to guide has helped our GGRC runners achieve heaps of new records over his tenure.